Okieladybug's Scrap N' More: Happy Easter! And A Last Minute Project! Happy Easter! And A Last Minute Project! First of all let me wish everyone a Happy Easter! My Easter is being spent with my family in Seminole. We generally get together for holidays and always have a wonderful time! This year I decided that the adults deserve to get something a little special and came up with these gable boxes. I made one for my daughter, aunt, cousin and 2 nieces. My sister doesn't get one...remember she got the frame! 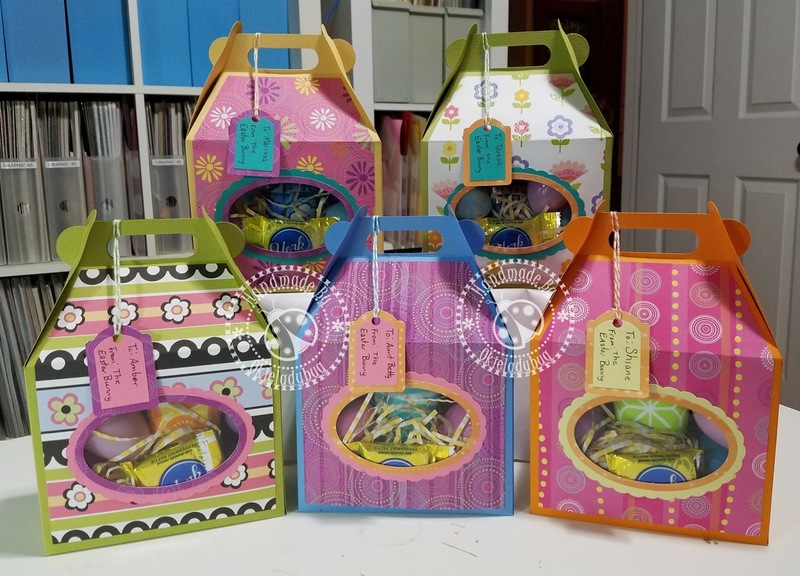 Inside each box is a small Bath and Body Works hand lotion, 6 plastic eggs with candy and then some other candy tossed in. The box measures 6" x 8.5" x 3" and used 2 pieces of 12x12 cardstock to make the base, 1 sheet of cardstock to make the patterned area and then 2 pieces of cardstock or patterned paper that measured about 3.5 x 5.5" for the scallop oval. I used a piece of acetate and put it between the cardstock base and patterned paper. The little tags were made using a Stampin Up punch and I used some bakers twine to attach a tag to each box. 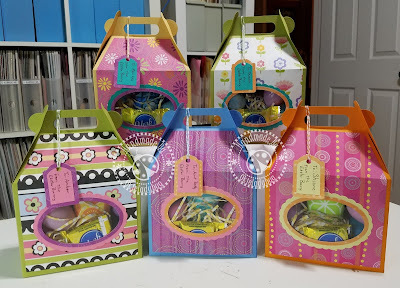 I had to schedule this post for this afternoon since if I did it for the morning the gals might see them before I, errrr....the Easter Bunny, delivers them. I'll have to let you know later what they said about them! WOW, I love these gable boxes, they are such a sweet gift, and they look so pretty as well. What a fabulous idea to give (errr ... have the Easter Bunny give) a special Easter treat to each of the adults as well. I love it, it's such a fun treat! presentation topic, which i aam going to deliver in academy.